A former Amsterdam Mohawk has tossed a no-hitter. James Dykstra, who pitched for the Mohawks in 2011, threw a no-hitter for Class A Advanced Winston-Salem Wednesday afternoon, the 15th no-hitter in Winston-Salem history. Dykstra faced off against the Potomac Nationals and 2012 Glens Falls Golden Eagle Nick Pivetta. Pivetta tossed five scoreless innings in the game before being lifted for a reliever. Not a single ball left the infield against Dykstra and he needed just 71 pitches to complete the gem. The only base runner he allowed was a walk to begin the fourth inning, but Dykstra promptly picked the runner off before the next pitch. In two starts this season, Dykstra has allowed just one hit and has yet to allow an earned run. His seven-inning no-hitter is the first Winston-Salem no-no since Levi Maxwell accomplished the feat on June 19, 2009. 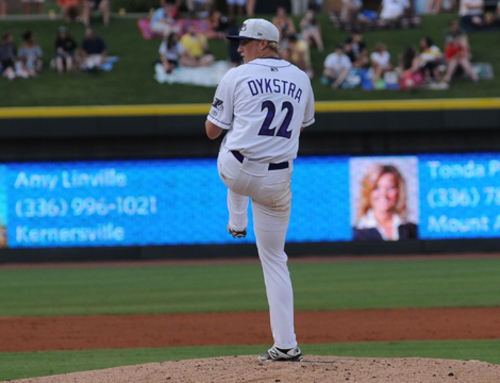 During the 2011 summer with the Amsterdam Mohawks, Dykstra went 2-2 with a 2.61 ERA in six appearances. He allowed just nine earned runs all summer and walked a mere five batters. No player homered off the right-hander. The last no-hitter thrown by a player in the PGCBL was by Amsterdam’s Taylor Blatch on July 27, 2014. That game was also a seven-inning affair. The right-hander struck out five batters and allowed six to reach base, one on an error in the fifth inning.